Pre-heat oven to 350 degrees. 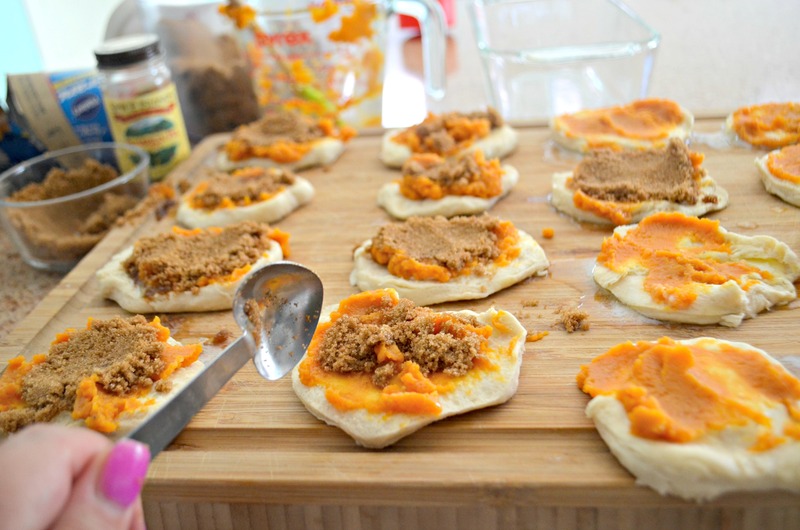 In a small bowl, mix together pumpkin puree, granulated sugar, and pumpkin pie spice. Set aside. On a large cutting board, separate each biscuit in half so that you'll end up with 16 rounds total, as there are 8 biscuits to a package. Spoon on a little melted butter to each round, followed by a little less than a teaspoon of pumpkin mixture. Sprinkle brown sugar over the top of each round. Stack them in groups of 4 rounds. Place them in a greased loaf pan in one continuous roll. Bake at 350 degrees for 40 to 45 minutes or until the loaf is deep golden brown and the center is baked through. It’s fall! Are you ready to bake all the pumpkin things? Try making this easy and delicious pull-part loaf that’s full of pumpkin spice goodness! These are easy to bake and would be such a great treat to enjoy on a cool fall morning. 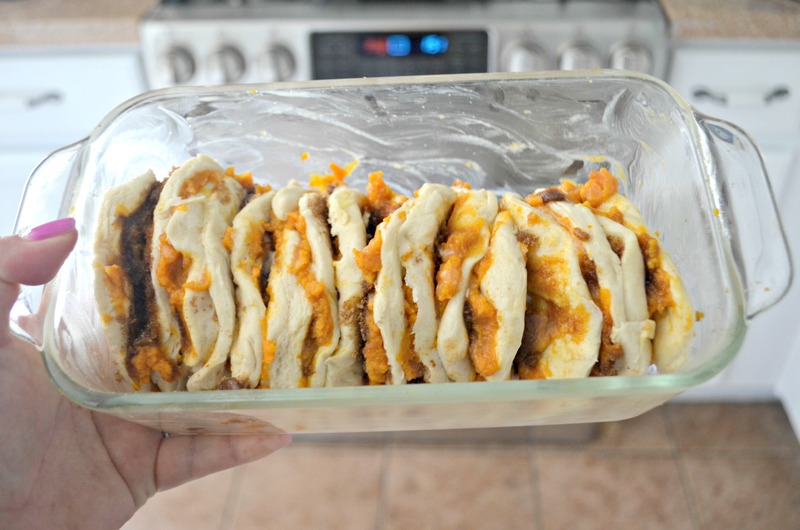 They taste similar to gooey cinnamon rolls, but with pumpkin! YUM! Fun and easy to make! Let the kids help. 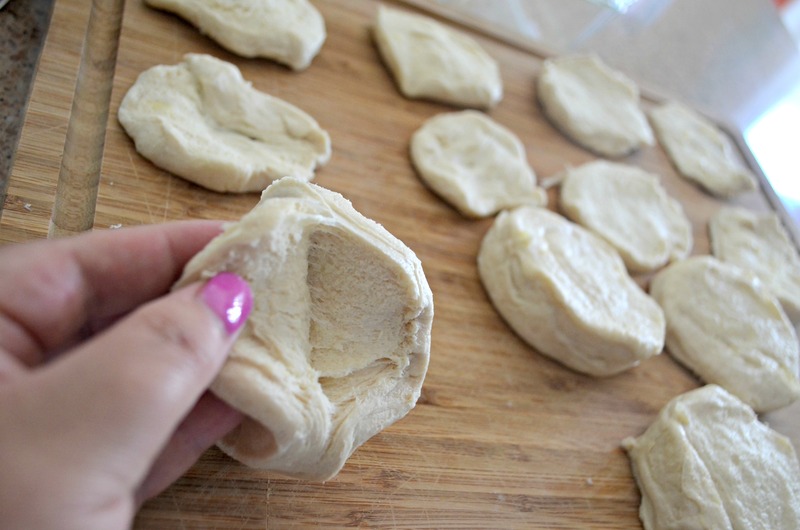 Using flaky refrigerated dough is a smart and easy kitchen shortcut! 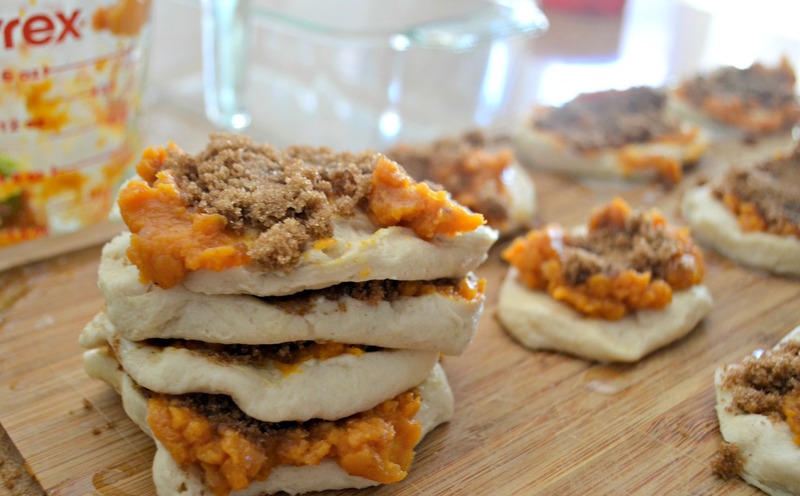 This process starts by dividing up each biscuit in half, and adding pumpkin, butter, and sugar to each round. Then we’re placing all these layers in a loaf pan to bake up into delicious, gooey pull apart bread! Even if it’s kinda messy like mine, it’ll come out great in the end! YUM. Sweet & Buttery pull-apart pieces of pumpkin spice heaven! If you’re a fan of all things pumpkin like me, this Pull-Apart Pumpkin Spice Loaf should definitely be on your list to bake! I love that it tastes like cinnamon rolls, is super easy to make, and the cream cheese glaze throws it over the top YUMMY! Pour a warm cup of coffee and enjoy a slice of pumpkin heaven! Up Next: Cozy up with This DIY Pumpkin Spice Latte! Ugh…too bad I’m trying to cut carbs. That looks awesome!!!! This looks incredible!! !😍🎃 can’t wait to try it! Thanks for sharing! Yummy! Keep the recipes coming! Will definitely be making this! Perfect! I think you’ll enjoy Whitney! Ooooo I will be watching! Thankssss! How long will this keep after making and would it need to be refrigerated? I would say a few days covered in the fridge would be good. They are yummy reheated like a cinnamon roll. I wish you guys would make a pintable with out the pictures on your recipes. I agree with heidi. If the steps that are attached to pictures had a separate text box from the picture box so you could delete just the picture and keep the text that would be nice. I wanted this one so bad that I spent the time to copy and paste it into a word document so I could print all the steps to fit to one page in order to add to my recipe binder. Thanks for the great recipes! Thanks and great suggestion Tina! I just made this recipe and my family loves it!! Not as sweet as cinnamon rolls and lots of flavor. I might even add a little bit more pumpkin spice the next time I make it. Definetly a keeper!! Also, I let it cool for 5 – 10 minutes before I put the glaze on top. This stuff is the best!!! So easy and my family ❤️ s it!! Thanks again Lina for giving us anew family favorite!! !